The sixth-century Orthodox monk, Saint Brendan, was perhaps the first Orthodox Christian to set foot on Canadian soil, and as such, is the first of the saints of North America. Saint Brendan is known as the "Voyager", since he undertook, with his monastic brethren, a unique pilgrimage across the ocean, one whose goal was truly a "better life" - not materially speaking, but a life fully trusting in Christ for his daily bread, for the path ahead of him, and for his safety and his very life. Shall I put myself wholly at Thy mercy, without silver, without a horse, without fame, without honour? O Christ, wilt Thou help me on the wild waves? It is often said that Canada is a nation of immigrants. More than perhaps any nation in the history of the world, the Canadian population is made up of those born outside her borders, those whose first loyalties were (and even still are) in another place, and whose homeland – the “Old Country” – is far, far away. Canadian civil culture is the culture of the immigrant: the man or woman or family who comes to the “new” country to seek a better material life, to flee from the dangers of war, persecution, or famine, to build a happier future for their children. On a certain level, all Canadians share this dream and hope, and would not begrudge it to others who come to our shore with the same honest aspirations. But is this a Christian hope? Unlike the American Puritans who crossed the ocean in search of religious freedom, most Orthodox Christians in the west did not come to North America to practice their faith, or to share it with others: they came for the land, for the jobs, for the prosperity and freedoms that would allow them to build a home, open a restaurant, and enjoy weekends off from work. The idea of building a common culture with every neighbour, knit together by a common faith and language, common values and common hopes, was left behind, exchanged for the shared culture of the marketplace. We see it in our conversations today, where neighbours of different cultural backgrounds avoid talk of spiritual or political questions, preferring to discuss home improvements, shopping, and bargain hunting. From those who two generations ago professed Orthodox Christianity as the centre of life in the homeland, we have become something very, very different indeed. 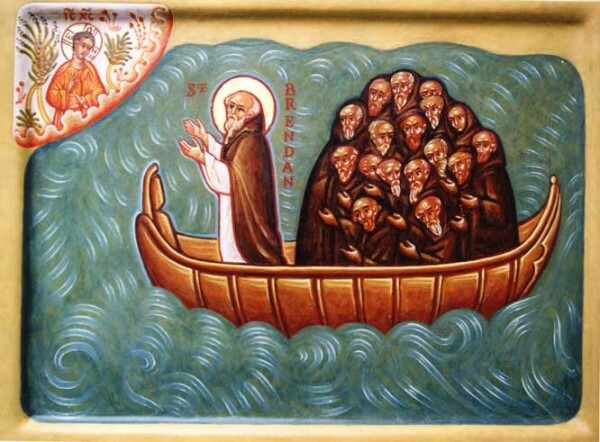 The sixth-century Orthodox monk, Saint Brendan, was perhaps the first Orthodox Christian to set foot on Canadian soil, and as such, is the first of the saints of North America. Saint Brendan is known as the “Voyager”, since he undertook, with his monastic brethren, a unique pilgrimage across the ocean, one whose goal was truly a “better life” – not materially speaking, but a life fully trusting in Christ for his daily bread, for the path ahead of him, and for his safety and his very life. Saint Brendan’s company continued the practice of Orthodox Christian Celts of their time, called peregrinatio – a kind of pilgrimage, with the destination left entirely up to Providence. As an act of faith, much like the ascetics of the Egyptian desert, these monks left the comforts of home, and charted a small boat laden with limited rations, their sail set for no direction in particular. They trusted – indeed, they trusted completely – in the destination God chose for them, whether it was a harrowing journey, some distant shore, or death at sea. This unique kind of self-imposed martyrdom, unique to the Orthodox Celts but one in spirit with the deserts of Egypt, the forests of Russia, and the mountains of Greece and Serbia, was a call suited to only a few souls out of thousands. Yet the same spirit of complete reliance on God, and the determination to place Christ at the centre of every decision, is not unique to the Orthodox Celts, or to monastics: it is central to the life of every authentically Orthodox Christian. It is common to hear members of Orthodox parishes of the immigration express their sadness that their children and grandchildren have lost their culture, and their Faith. In fact, this is not entirely true. For many – indeed, for most – the goals of a better house, bigger property, a successful business, and more material wealth have been successfully passed from one generation to the next, virtually uninterrupted by the practice of the Orthodox Faith. The same purpose that was behind much of the immigration of our ancestors, wherever they came from, and whenever they came, has been with a few exceptions, successfully handed on to each generation. The real question – the only real question for Orthodox Christians – is whether the central goal in crossing the great oceans to come to Canada was an Orthodox Christian goal at all. For Saint Brendan and his company, the first Orthodox Christians in Canada, the purpose of the trip was clear. For us, immigrants, and the children of immigrants, we must ask only if we are the inheritors of the legacy of the saints who made the dangerous journey to this land, or whether we are the inheritors of the spirit of the shopping malls, which steal away so much of our heritage, our time, our children, and our hopes. Saint Brendan, pray for us! For a more thorough investigation of the pilgrimage of Saint Brendan, download the audio lecture by Hieromonk Ambrose (Father Aleksey Young) entitled The Uniqueness of Celtic Monasticism, available at www.asna.ca/angloceltic.